The medical industry is under increasing legal pressure these days owing mainly to a consumer-friendly risk environment. This is evident from restrictive legislation and recent landmark cases, such as the PIP case, concerning a French company that supplied thousands of women with (allegedly) defective breast implants, and the Boston Scientific case, which dealt with pacemakers and cardioverter defibrillators. Reference is made to the European Commission that has recently started trialogue negotiations to revise the Medical Devices and Diagnostics Directives. The duties and responsibilities of notified bodies are further increased and specified. In many cases, this would create more work than is currently required by the so-called interim measures already imposed. As a result, costs for manufacturers would increase. Furthermore, the PIP case shows that not only manufacturers, but also notified bodies and hospitals/physicians are increasingly subject to claims across Europe, and the Boston Scientific case shows that the European Court of Justice extended the risk of liability and compensation of damages for manufacturers. In Germany and France, patients and distributors started proceedings against the notified body in question - TÜV Rheinland. Although in both jurisdictions the Medical Devices Directive served as the legal basis the outcome was, in first instance, the complete opposite. According to the French Court of Toulon in 2013, TÜV Rheinland had violated its duty of care under the Directive against patients because it had not properly assessed the breast implants. However, according to the German Court of Frankenthal in 2013, TÜV Rheinland did not violate its duty of care. This was confirmed on appeal. On 2 July 2015, the Aix-en-Provence Court of Appeal reversed the judgment of the Toulon Court. The French Court of Appeal stated that TÜV Rheinland had 'fulfilled their obligations' in certifying the breast implants made by PIP. TÜV Rheinland could not have discovered the fraud. Although TÜV Rheinland is discharged for now, the German and French judgments raised questions about the principle of liability of a notified body responsible for granting CE marking. The European Court of Justice needs to provide further guidance, which it soon will, as the German patients have filed an appeal in Cassation. Consequently, through a court order dated 9 April 2015, the German Bundesgerichthof brought forward several questions for preliminary ruling to the European Court of Justice. 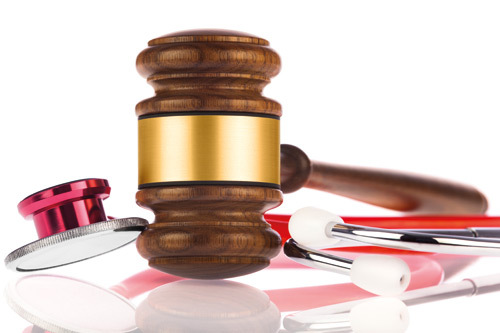 It comes down to the scope of the notified body's responsibilities under the Medical Devices Directive, more specifically the question of what patients may expect from a notified body, and whether the notified body can be liable under civil law. PIP patients in the Netherlands employed a different strategy, issuing a summons to the hospital for implanting defective breast implants. In 2014, the Dutch Court of Appeal in 's-Hertogenbosch initially assumed that the breast implants were defective and awarded the claim by attributing the manufacturers' negligence to the hospital. However, in a recent PIP case where medical funds had summoned various hospitals, the Dutch Court of Amsterdam came to an opposite judgment. A striking point is that, in its judgment of January 2016, the Amsterdam Court took into consideration the afore mentioned judgment of the French Court of Appeal of 2015. As TÜV Rheinland could not have discovered the fraud, the hospitals couldn't either. Irrespective of the outcome of proceedings, the PIP cases show that the whole medical sector seems to be increasingly exposed to product liability claims. Although Europe is trying hard to harmonise legislation, courts are still struggling with the interpretation of the applicable European Directives. In its judgment of 5 March 2015, the European Court of Justice not only stretched the definition of the term 'defect', but also refined the traditional definition of the term 'damages'. Pacemakers: the quality system had shown an increased failure rate and therefore a replacement was recommended. Cardioverter defibrillators: the quality system had shown the possibility of a component defect and therefore the manufacturer recommended deactivating the relevant component. Although there was no proof of an actual defect in the products, the patients underwent revision surgeries and the medical devices were replaced. The revision surgery was paid for by medical funds. As subrogated in the rights of the patients, the medical funds tried to recover the costs by seeking damages from the manufacturer. the severity of the potential risk. For products like pacemakers and cardioverter defibrillators, the claimant only has to show that his or her product is part of a series or group that is subject to a potential defect. As a consequence, the burden of proof has become much easier for claimants. The second question was whether damage caused by a surgical operation for the replacement of a defective product, such as a pacemaker or implantable cardioverter defibrillator, constitutes 'damage caused by death or by personal injuries' as mentioned in Art. 9 of the Directive. The European Court of Justice confirmed a broad interpretation of Art. 9 of the Directive: compensation for damages also covers the costs relating to the replacement of the defective product, under the condition that such an operation is necessary to overcome the defect in the product in question. This judgment imposes a higher level of risk on manufacturers and their insurance companies. Contrary to the traditional argument where the claimant had to prove the defect, manufacturers can now be confronted with a risk of liability not only for defective products, but also for potentially defective products. In my opinion, the legal world should be careful not to apply this argument too quickly to other kinds of medical devices. However, across Europe we see that patients and medical funds are trying to convince the courts in various jurisdictions to apply the Boston Scientific judgment. This puts more pressure on manufacturers of medical devices to properly defend themselves. The current risk environment has become increasingly more demanding as it becomes more and more consumer friendly. This follows on from tightening regulatory legislation, exposure to claims of various parties and a broad scope of applicability of the Product Liability Directive. More consumer protection leads to a higher financial risk for manufacturers and other parties involved. Pressure on the industry makes innovation a further challenge. For this it's even more important to invest in product compliance, agree on contractual indemnities if possible and obtain adequate insurance. Manufacturers shouldn't concentrate on cost efficiency in production, as the higher costs of claims handling are potentially linked to cost reductions in production, as Chris Tait, European Life Science Underwriting Manager at insurance company Chubb, mentioned in November 2015 at the CMS Life Sciences Forum in Frankfurt. Last but not least, when the damage is done, it is important that manufacturers use in-depth knowledge to choose the right strategy in the jurisdictions involved, as the interpretation of the applicable Directives may vary.